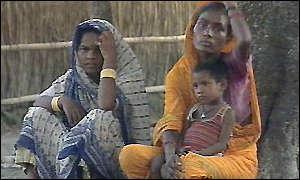 Possibly the most substantial percentage of Asia's Blacks can be identified among India's 160 million "Untouchables" or "Dalits." Frequently they are called "Outcastes." Indian nationalist leader and devout Hindu Mohandas K. Gandhi called them "Harijans," meaning "children of god." The official name given them in India's constitution (1951) is "Scheduled Castes." "Dalit," meaning "crushed and broken," is a name that has come into prominence only within the last four decades. "Dalit" reflects a radically different response to oppression. "The African-Americans also must know that their liberation struggle cannot be complete as long as their own blood-brothers and sisters living in far off Asia are suffering. It is true that African-Americans are also suffering, but our people here today are where African-Americans were two hundred years ago. African-American leaders can give our struggle tremendous support by bringing forth knowledge of the existence of such a huge chunk of Asian Blacks to the notice of both the American Black masses and the Black masses who dwell within the African continent itself."